Tuesdays 9.45 – 11.15 a.m.
Wednesdays 7.00 – 8.30 p.m. Cost: £16.00 drop-in Or £96.00 for 8 consecutive – £12 per class classes paid after attending the 1st class. My Concession is £10.00 per class. YogaBirth offers a safe, integrated form of yoga, carefully adapted for women to practice from twelve weeks of pregnancy up to the birth. Adjustments and modifications can be individually tailored so that no previous experience of yoga is necessary to join a class. Post Natal Yoga (recovery) Classes: Everyone who comes to the yoga classes during their pregnancy will be sent an e-mail giving details about the Post Natal classes. Women bring their baby’s to this class and the focus is on the mother’s post natal recovery, pelvic floor, core muscles, shoulders and lower back issues. 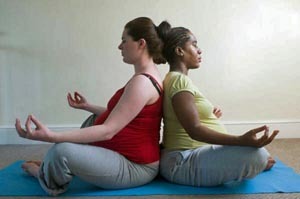 These classes are open to women who did not attend the prenatal yoga classes. Classes are 1hr 30 mins x 6 cost £84.00 (concession offered) This class is open to any woman who has recently had a baby . Individual sessions can be arranged. Baby Massage: At 2 of the post natal session there is a 30 minute session on baby massage using some acupressure points.
. Contact Kathleen Beegan if you have any questions on kathleenbeegan@hotmail.comor 07753700435Approved by the Director of Midwifery GSTT NHS Foundation Trust.